The Ultrasonic Point Level System HT1620 detects liquid in storage vessels, tanks and pipes, designed for almost any liquid level application. The probe is constructed in 316LSSmaterial. The electronic module is captured in a plastic cassette and is mounted in a NEM proof housing. There is no adjustment for the system. A on the electronic module offers a visual status of the system. Field selectable Fail safe allows for the relays to be energize in normal condition to close when liquid is present. Diagnostic checks connection of the probe. A Demand Push button self test feature on the electronic module assures the user the system is functioning correctly. A delay in is added in on the liquid down to avoid false trip due to wave action. 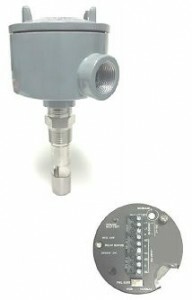 The HT1620 Series unit consists of two piezoelectric elements mounted in the housing of the sensor. These elements convert mechanical energy in the form of high frequency sound to electrical energy and vice versa. There are mounted parallel and opposite each other in the probe. A high frequency sent from the electronics to the transmitting element, this vibrates the element at 2 to 4 MHz. Air or gases will not carry sound at this high frequency and does not travel across the sensor gap.When the gap is filled with liquid, the sound will travel across the gap to vibrate the receiving element. The vibration generates an electrical signal that is amplified and read by the detector circuit in the electronics as a “wet” signal. The signal is converted to relay output or a shift in milliamp output. Delay (on): 0.5 seconds Standard. Options available. Probe material: 316SS Standard. Optional material available. Actuation point: 1.0” Standard. Up to 99” available. Sensor Pressure: 1000 PSIG 316SS. Process connection: ¾” NPT Standard.